Using the attached clip, position the bluetooth speaker on the driver or passenger's side vehicle sun visor (based on who is the primary user). 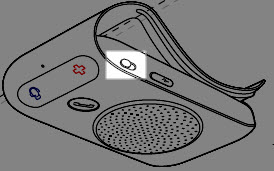 Slide the On/Off Switch on the side of the speaker to power it on or off. When the switch is on, Bluetooth remains on; refer to these instructions for pairing with a device. The Bluetooth is on when the switch is in the position closest to the top of the speaker.